The New Year is quickly approaching, and that should be enough motivation to get you off the couch, follow these tips from online fitness platform Redux.Fit. Redux.Fit is a premium service with 1-on-1 training via online video connecting clients with top personal trainers for personalized workout routines designed to help you get motivated from the comfort of your own home. Working out can be extremely rewarding and strengthen not only for your body. Redux.Fit offers three ten-minutes each “Supersets” to get your started off. To help you and a partner, perform each exercise as a superset, meaning one after the other without stopping to rest. 1. Start Superset #1 by facing your partner to motivate you. First, stand with your hands directly out in front of you at shoulder’s length. Run in place, bringing your knees to meet your palms each time you lift your leg. To get the most of your workout, keep your hands up and don’t cheat by lowering them. Do this for 60 seconds. 2. Moving on, follow this up with 60 seconds of jumping jacks. 3. Then, starting from a standing position, bend your knees and bring your hands to the floor. Jump your feet back into a straight-arm plank position. After, jump your feet back into your hands and follow this by jumping straight into the air. These motions are know as burpees—do this for 60 seconds. Repeat each of these three exercises three more times. At the end of your third round you can rest for 60 seconds. Repeat each exercise 3 times. 1. Moving on to the Superset #2, have you and your partner grab a stability ball and lie flat on your backs next to each other. Hold the ball between your feet and simultaneously raise both your upper body and legs to create a V-shape with your entire body. After, pass the stability ball from your feet to your hands. Then, pass the ball from your hands to your feet using the same motion. Repeat this until 60 seconds are up. 2. On to the next position—60 seconds of alternating reaches. 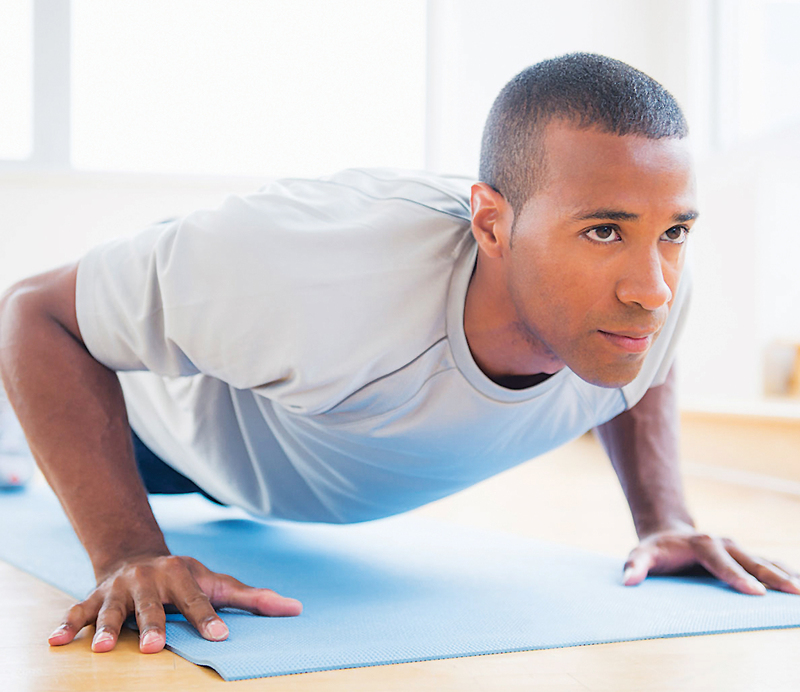 Position yourself in a straight-arm plank position still facing your partner. Lift your right hand and left foot at the same time, keeping hips parallel to the floor. Shake hands with your partner and then lower your right arm and leg back to the floor before repeating on the opposite side. 3. The last exercise of Superset #2 involves a little motivation! Have both you and your partner lie on your back with knees bent and feet flat on the ground, positioning legs so that your partner’s legs are outside of yours. Have your partner lightly press their legs against the outside of yours while you do the opposite, pressing your legs against the inside of theirs. At the same time, perform a sit up with your partner. When you both reach the top, give each other a quick kiss before reversing back to the starting position. Repeat entire Superset three times. 1. The last Superset #3 focuses on four 60-second exercises. The first involves standing with your feet turned out; bending your knees and dropping hips back to allow a kettle bell to swing between your legs. At the same time, stand up and lift the kettle bell up to eye level allowing the momentum of the weight to guide you. Reverse the order allowing the bell to freely swing back between legs with each rep.
2. Moving on to the second exercise, keep your feet parallel and shoulder length apart, holding the kettle bell from the bottom while you perform a squat in a 90-degree angle. Then, return to the starting position before stepping your right foot behind you in a 90-degree reverse lunge. Return your right foot to the starting position and then begin with your left side. 3. The next exercise involves push up into toe touches, positioning yourself in a straight-arm plank as your perform a push up. Return to the straight-arm plank position before drawing your hips into a “downward dog position” and reaching right hand back to touch left root. Return to the starting position before performing another push up and performing the toe touches on your other side. Go on to the squat pivot press, starting with feet parallel and shoulder length apart, holding kettle bell by the handle with your right hand resting the bell against your forearm. Perform a squat and simultaneously return to standing while performing a shoulder press and rotating hips/upper body to the left. Complete 30 seconds on your right before switching to your left. 4. Finish off with a forearm plank for 60 seconds before repeating this Superset #3 two more times. Redux.Fit is a perfect solution for any busy person that needs help to get in shape offering custom training sessions, the hour long training sessions start at $20 per session. Find out more information at redux.fit.